It is common to see map crack networks over the concrete elements of aged infrastructure along with leaching signs. It might be interesting to know that no structural collapse has been reported so far because of the ASR cracking in North America. However, the question arises as to whether it is required to manage ASR cracking within concrete structures. In this article, we will study the combined effect of corrosion in concrete and alkali-silica reactions. ASR is a chemical reaction between active silica minerals (normally in aggregates) and alkaline particles (Na2O, K2O in cement) in the concrete pore solution. The reaction requires water to happen. The product of this reaction is called Alkali-silica gel and it fills the voids within the micro-structure (such as micro-cracks, pores, etc.). ASR gel can swell and expand significantly when it comes in contact with water; this can produce a high internal tensile stress causing further cracking inside concrete. 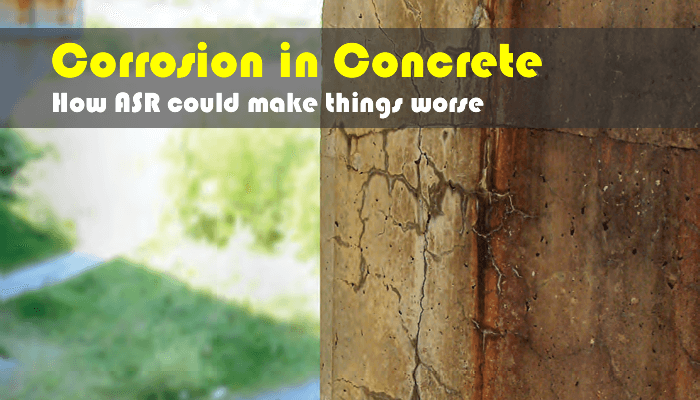 How ASR can accelerate corrosion in concrete? 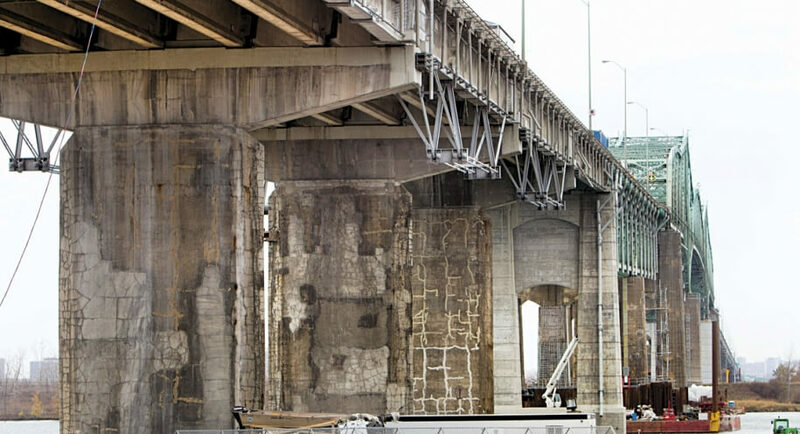 Chloride induced corrosion is a major cause for many durability related issues in reinforced concrete structures. In normal condition, concrete cover provides protection over reinforcement. However, the structural cracks caused by excessive loading, and cracks developed as a results of harsh environmental loading (corrosion, ASR, freeze and thaw) can damage aggravate this condition. Indeed, the cracks developed as a result of alkali silica reactions can create direct paths through which aggressive ions such as chloride (either from sea water, or from the of de-icing agents) can penetrate into the concrete. In simple words, and ASR affected concrete cover is less effective in providing protection over reinforcement. In this context, ASR can significantly increase the corrosion activity. ASR has two contradictory effects; I already discussed about the negative side in the previous section. Then it comes the positive side of the story. The positive one that is recently determined by structural engineers is related to the loading capacity of certain concrete elements. For instance, this autogenous tensile stress produces a self-pre-stressing condition in the compression zone of concrete beams, where the amount of bending steel rebar is lower compared to the tensile zone. This phenomenon is entitled “hogging effect”. This can improve the ductility, and strength of the section; however, it does not improve durability performance of the component. This entry was posted in Concrete Deterioration, Corrosion, Inspection and Evaluation and tagged Concrete, Corrosion. Bookmark the permalink.